Robolution is a supplier in the field of system engineering. The many years of experience, especially in the field of automated welding technology, is reflected in the many and successful solutions offered by the customers. 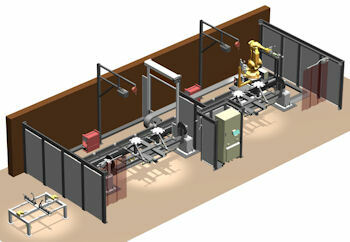 Standard robotic welding system, as well as individually tailored system concepts are a hallmark of Robolution. Robolution is not limited to welding applications, but also implements any additional peripherals. Whether handling, further processing or material flow; The Robolution team will also find the best solution for you. A concept with a ground track is often used when the components to be machined exceed a length of 2,500 mm. In this case, the robot is located on a carriage (driven by an external axis of the robot) and thus can cover the required working area. These concepts are available as single or multi-station systems. In this case, the components can be positioned on a fixed table, or by means of a reversing / counter-bearing (for horizontal rotation) in front of the ground track. A concept with a 5-station system is often used when short cycle times are required. 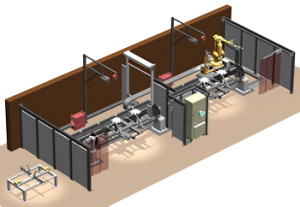 The welding robots used (in this case 6 pieces) share the required welding tasks. 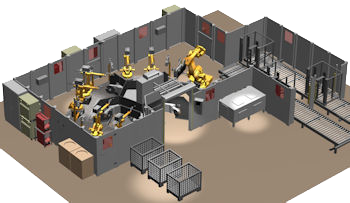 Using a handling robot, the welded component can then be removed in the following station. Thus, an empty device is available to the operator in the insertion area. The 5-station table can be equipped with rigid mountings or, as in this case, with 5 horizontal rotary axes of type TurnRot.